The Duke of Edinburgh arriving for the Queen's Christmas lunch at Buckingham Palace. THE MAJORITY OF Irish people think that there shouldn’t be an upper age limit. In response to a poll for Claire Byrne Live/Amárach Research, 47% responded to say that there shouldn’t be an upper age limit. 4% said that drivers in their 70s should forfeit their licence, 18% said it should extend to drivers in their 80s, and 16% said people aged in their 90s should be the maximum allowed. Another 15% said that they didn’t know. A debate on whether there should be a maximum age limit for drivers was sparked last week after 97-year-old Prince Philip was involved in a car crash. Two women and a baby were the occupants of the other car, and were treated in hospital for minor injuries. 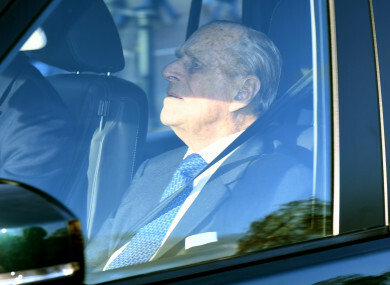 Today, police questioned the Duke of Edinburgh for driving without a seatbelt. Images published in Sunday newspapers appeared to show him behind the wheel of a replacement Land Rover on a private estate on Saturday. A Norfolk Constabulary spokeswoman said the force was aware of the photographs and that “suitable words of advice have been given to the driver”. The poll questions were carried out by Amarách Research for Claire Byrne Live earlier today, Monday 21 January. Email “Most Irish people think there shouldn't be an upper age-limit for drivers”. Feedback on “Most Irish people think there shouldn't be an upper age-limit for drivers”.